After you have moved your ships and then had one combat round, the enemy side will get to move their ships and then there will be another round of combat. A game turn is completed once both sides have moved and fought. Ownership of cities is adjusted based on where each side's transports are located. Cities are worth 200 to 500 victory points each turn for the side owning them. The resources generated by the city are also added to the owning side's resource pool at this point for new ship construction. 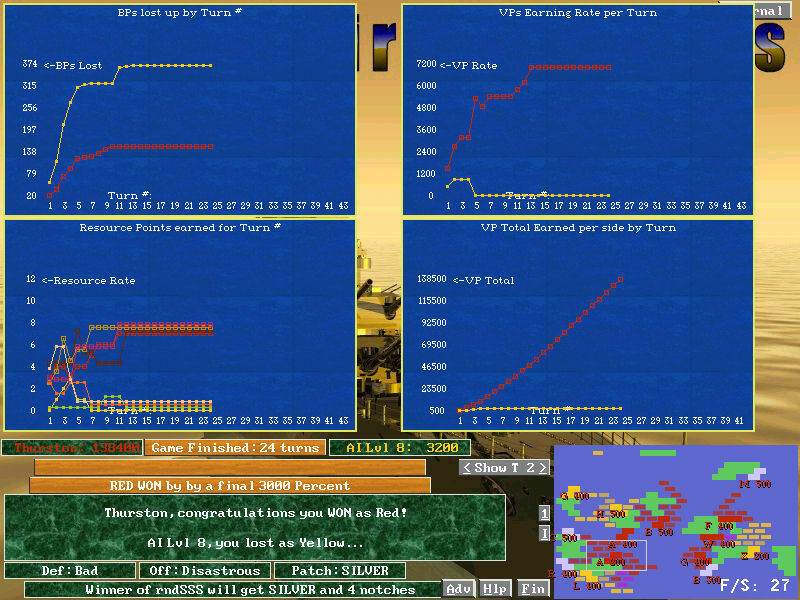 Once all victory points and resource points have been accounted for, a new turn will start for both players, continuing until the battle is finished. Victory is based not just on having more Victory Points than the enemy. Often you will have to outscore the enemy by quite a ratio of total scores, and completing special mission objectives is very important to success.